While the former South Sydney and Melbourne star will almost certainly be inducted into the Hall of Fame, questions loom over whether he will ever fulfil the ‘future Immortal’ tag some have bestowed on him. Appearing on the inaugural episode of the Game of Codes podcast on Tuesday, Roar NRL Expert Tim Gore and Editor Daniel Jeffrey made it clear they don’t quite meet eye to eye on whether the 263-gamer deserves the league’s highest honour, with the former contending there’s only one current player worthy of the accolade, and it’s not Inglis. 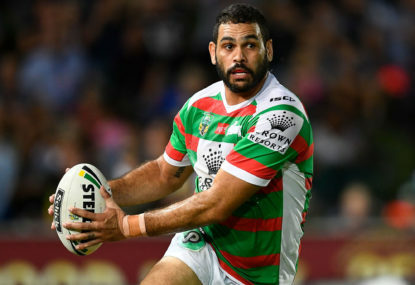 After a 14-year career in rugby league’s top flight, Inglis bows out of the game with 149 NRL tries to his name and three grand final victories – two with Melbourne and one with South Sydney – as well as 32 Origins for Queensland and 39 Tests in the green and gold of the Kangaroos. As for individual accolades, Inglis has plenty of them. A Wally Lewis Medallist and two-time Dally M representative player of the year, he was also named fullback of the year and five-eighth of the year on separate occasions. But is that enough to see him handed rugby league’s highest honour? Listen to the debate on Game of Codes and then have your say in the comments below. Listen to the full episode below and subscribe to Game of Codes on Apple Podcasts, iHeartRadio or wherever else you get your podcasts.